Many public and private groups joined forces on Saturday, April 28, for a community tree planting in the headwaters of the Paint Branch watershed. Volunteers commemorated Earth Day by planting 350 trees near the stream in the parkland south of Good Hope Road between New Hampshire Avenue and Briggs Chaney Road. Sponsors included Eyes of Paint Branch, St. Stephen Lutheran Church in White Oak, and the Potomac-Patuxent chapter of Trout Unlimited. Several public organizations were also involved. Prior to the planting, the Metropolitan Washington Council of Governments (COG) dug all 350 holes with a power auger. 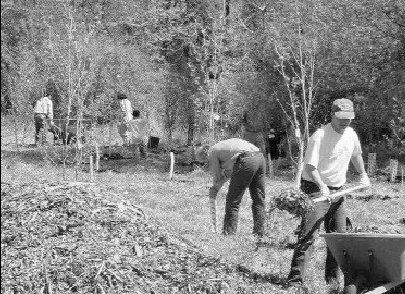 This was a big labor-saving contribution, and made the planting of such a large number of trees possible for a single morning event. Brian LeCoutur, COG's urban forester, represented COG at the planting. Candy Bunnag, an environmental planner with Maryland-National Capital Park and Planning Commission (MNCPPC), and Carole Bergmann, M-NCPPC's forest ecologist, found an appropriate planting site and selected tree species, as well as arranged for the delivery of mulch, preparation of landscape mats to control weeds, tree wrap, and Tubex protectors. Wayne Noll, a forester and inspector with MNCPPC, also helped with preparations and planting. In addition, MNCPPC also donated approximately 100 trees grown at their Pope Farm facility. 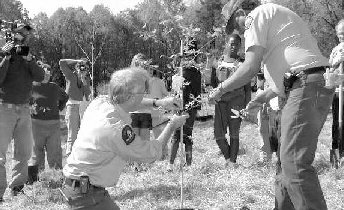 Kenneth Jolly, a forester with the Maryland Department of Natural Resources (DNR), demonstrated proper tree planting procedures and assisted throughout the event. The larger trees were among 250 obtained through DNR's TREE-MENDOUS Maryland Program. They were purchased with funds obtained from forestry-related violations, such as illegal clearing. By using the fines paid by violators in this way, DNR and MNCPPC hope to be able to offset the effects of these violations. Gwen Strike and Rachel Schmidt of the Stewardship Committee at St. Stephen Lutheran Church led its efforts. In addition to providing volunteers for the planting, St. Stephen staffed the welcome table and provided morning refreshments and a wonderful lunch at the church after the planting for all participants. Riparian buffers such as this newly planted area are important because they slow down and filter runoff, helping groundwater aquifers to recharge. 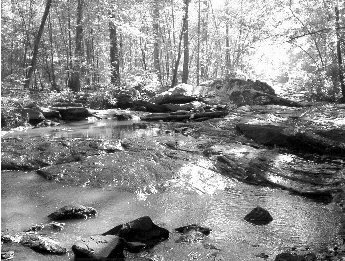 These aquifers are the source of the cold, clear water that flows in the Paint Branch and supports the wild brown trout. This year marks the 23rd consecutive year--every year since monitoring began--in which the Paint Branch wild trout have successfully reproduced. The planting of trees is the least self-centered of all we can do. It's a purer act of faith than the procreation of children." The University of Maryland is currently preparing a Master Plan for the campus in College Park. This Master Plan is to guide their decisions pertaining to facilities for the next 10 to 15 years. As a result of intense public pressure on environmental issues over the past year, University officials are considering including an environmental component in the plan. The University contracted with Biohabitats, an environmental consulting firm in Baltimore, to make recommendations for the Master Plan. The preliminary report from Biohabitats, with a “greenUM” theme, was delivered in April, and presented a strong picture of where the campus is environmentally, and where it should be going. The report defines a good overall framework for a sound long-term environmentally sensitive plan for this campus, including priorities for riparian buffers, wetlands, storm water management, and reduction of energy consumption. This is a major step forward for the University. The Eyes of Paint Branch has been an outspoken critic of the University's environmental record in the past, but we strongly support the recommendations in this preliminary report. The report is available at www.allaboutmike.com/greenum/. Now we need to convince University officials to include these environmental recommendations in the Master Plan. We urge all students, faculty, and community members who care about the environment to write letters and e-mails to University officials urging them to implement Biohabitats' recommendations. A simple letter, such as the example below, urging them to implement this plan, is all that is needed. It is also important to send copies of your letter to President Mote and Vice President Sturtz, since the provost will be leaving soon. * Improve the University's operations to foster ecological stewardship. The inclusion of this report in the Master Planning process is a major step in the right direction. Now all of the greenUM recommendations must be included in the final Master Plan, and immediate steps must be taken toward implementing them. The Basewide Ecological Risk Assessment for the planned Federal Research Center at White Oak was completed in March 2001. This is the former Naval Surface Warfare Center on New Hampshire Avenue. The Paint Branch stream flows through the gorge on the facility grounds. The full report is to be made available at the White Oak Library. EOPB Action Chair David Dunmire has reviewed two sections from the study, the Executive Summary and Conclusions sections, and will send this material to any interested individuals. If the report is not in the library, and you would like to see the full report, contact Walter Legg of the Navy at 202-685-0061, or by e-mail at walegg@efaches.navfac.navy.mil. 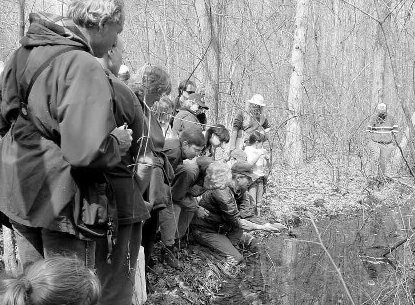 John Parrish, kneeling at center, identifies several different species of frog eggs in a wetland near Good Hope tributary. Eyes of Paint Branch has released a new survey of the biodiversity and significant habitats of the Paint Branch watershed. 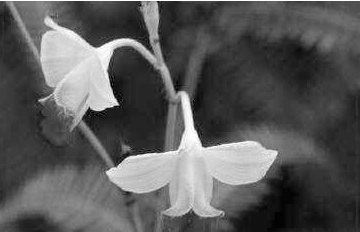 The survey lists both native and invasive flora species and includes several species of ferns and orchids. It catalogs rare, threatened, and endangered species, including "watchlist" species (as designated by the State of Maryland Heritage and Biodiversity Conservation Program). In addition, it examines the restricted and sensitive plant communities found in several places throughout the watershed, including at rock outcrops, Thompson Seeps, Powder Mill Bog, McKnew Bog and Forest, and Little Paint Branch I-95 Bog. Preliminary lists of amphibians and forest-dependent birds are also included. The study, commissioned by the Eyes of Paint Branch, covers the year 2000 field season in both the Montgomery County and the Prince George's County portions of the watershed. The study was funded as part of a grant from the EPA's Chesapeake Bay Program Small Watershed Grant, administered by the National Fish and Wildlife Foundation. Author John Parrish, a local field botanist and ecologist, writes in the survey that the greatest threat currently facing the Paint Branch watershed is something called "cumulative impact." Parrish describes this phenomenon as the accumulated effects of millions of smaller impacts to the environment that have added up over time, resulting from choices we watershed residents all make daily. He adds that "every individual, home or business owner, and government official can contribute to either the restoration and protection or the degradation of our natural environment." habitat loss and ecosystem degradation resulting from suburban development (roads, housing, schools, and business development); the watershed has lost nearly three fourths of its forests and one third of its historic (pre-colonial) nontidal wetlands, and forest and wetland acreage continues to decline. forest fragmentation, leading to the isolation of flora and fauna populations in tracts of forest that are often too small to support the ecosystem. invasive species, which outcompete and displace native species. use of off-road vehicles, which cause extensive destruction of vegetation, floodplain, and wetland areas and "are a source of erosion, sedimentation, soil compaction, vernal pool destruction, noise, and pollution." sand and gravel mining, which destroys natural habitat and causes increased soil erosion and stream sedimentation. stormwater runoff/impervious surfaces, which leads to streambank erosion, stream habitat sedimentation, increased pollution from toxic compounds, and dangerous increases in stream water temperature, and can reduce the stream's base flow. The impervious area for the entire watershed stands at 18 percent, well above the 10 percent limit determined to be the maximum for a watershed supporting trout habitat. In addition to listing the threats to the watershed, Parrish suggests specific actions that will be necessary to maintain the native biodiversity. Some of these, such as parkland acquisition, conservation easements, and development design that spares forests, must be pursued in cooperation with government agencies. But he also suggests a number of things that individuals can do (see box). Parrish stresses that "we all must be conscious that even our smallest actions are important and play a significant role in the healing or destruction of the 'natural' quality of life. Our air and water quality is directly affected by the accumulation of each of our daily actions. Do we drive our car everywhere or do we sometimes choose to walk or ride the bike? Do we use lawn and garden chemicals that run off and kill aquatic life or do we choose to garden organically? Do we dump piles of yard waste in the local park or do we recycle our leaves and grass clippings? Millions of such decisions, if changed, could halt and reverse previous destruction. . . . The quality of life within the Paint Branch Watershed depends directly on preservation and restoration of forests, wetlands and native biodiversity." The full study will be available soon on the EOPB Web site at www.eopb.org. The legislation establishing the Upper Paint Branch Special Protection Area (SPA) is the centerpiece of all efforts to protect our watershed. The special rules and regulations that apply to this headwaters area of the watershed are essential to protect the high water quality that allows the tremendous aquatic diversity. A resident of Wembrough Ct., in the upper Left Fork, dammed up the stream behind his house to water his garden during the record drought. In addition to illegally encroaching on public parkland, this dam blocked a stormwater outfall for the neighboring community. A landscaping business on Thompson Rd., also upper Left Fork, has applied for a special exception, after expanding the size and imperviousness of its business without permits. A show-cause hearing for revocation is scheduled for Sept. before the Board of Appeals. A tree Service company on Rt. 198 in Spencerville is operating without permits. Illegal dams have been constructed on the Left Fork at Peach Orchard Rd. Illegal motorized dirt bike activity in the upper Right Fork is causing severe erosion to the streambanks. A garden Center and Landscaping company at New Hampshire Ave. & Cape May Rd. is violating its special exception permit by expanding the area of operation and not controlling stormwater runnoff. A show-cause hearing for revocation is pending. Numerous construction areas in the SPA have been in violation of sediment and erosion control regulations. Pink Lady's Slipper, one of the largest native Orchids, is only found in low, sandy, wooded areas. A number of restoration projects at various locations throughout the Paint Branch watershed are underway. The U.S. Army Corps of Engineers is conducting a multi-million dollar project to restore the Anacostia Watershed, which includes more than 60 projects in the Paint Branch watershed. The Montgomery County Department of Environmental Protection (MCDEP) is a partner with the Corps on these projects. MCDEP also has a number of its own restoration projects. Last year the Corps completed the Gum Springs Parallel Pipe Project, in which they diverted the stormwater discharge from the sensitive Gum Springs tributary to the larger Main Stem of the Paint Branch. It also initiated three stormwater management projects, Tanglewood, Snowden's Mill I, and Snowden's Mill II. Unfortunately, there were many problems with these projects. As a result of pressure from the Paint Branch Technical Team, the Corps is in the process of finding another contractor for this work. The Paint Branch Technical Team includes representatives from the Maryland Department of Natural Resources (the resource manager), the Maryland-National Capital Park and Planning Commission (the landowner), the Metropolitan Washington Council of Governments, the Montgomery County Department of Environmental Protection, the Eyes of Paint Branch, and the Potomac-Patuxent chapter of Trout Unlimited. The earthen embankments constructed last year at Snowden's Mill I and II did not pass inspection. These will need to be removed and then reconstructed. This activity should begin in a few weeks. The Corps is currently finalizing work at the Tanglewood site. In addition, the COE is beginning the next phase of restoration projects, which involve significant in-stream construction. This work is on the main stem, between Fairland Road and Martin Luther King, Jr. Park. While we enthusiastically welcome the Corps’ major improvements in terms of streambank stabilization, we are concerned that restoration of aquatic habitat in this section of the stream is also needed. The Paint Branch Technical Team has also reiterated this need several times throughout the review process. The Corps has responded positively to many of the concerns expressed by the Paint Branch Technical Team. However, we remain extremely concerned about the aquatic habitat restoration aspects of these projects. Habitat restoration is difficult to get right, and the potential for damage is always present. Frequently, small changes in implementation can make the difference between successful habitat restoration, and what amounts to a well-intentioned but wasted effort. That is one reason why someone with fisheries expertise and first-hand experience with restoration of wild trout habitat needs to be in a leadership capacity, at least for the critical habitat sites. We have made it clear that the support of the Eyes of Paint Branch, the Potomac-Patuxent chapter of Trout Unlimited, and the Audubon Naturalist Society is contingent on this. Despite letters to Colonel Fiala, the Corps District Engineer, Congressman Al Wynn, and Senators Sarbanes and Mikulski, the Corps has not yet agreed to provide this expertise. In addition to these projects, the Corps is also conducting a number of other projects concurrently. These include similar projects in the Northwest Branch watershed, Sligo Creek watershed, and at Lockridge Drive and Snowden's Mill I and II in the Paint Branch watershed. Given that the Corps is now more than a year behind schedule on the initial, simple, Paint Branch projects, we are concerned about the Corps' ability to properly manage the more difficult in-stream projects along with these four other concurrent projects. In addition to all these restoration activities, MCDEP is also conducting a number of restoration projects in the Paint Branch watershed. MCDEP will be initiating construction of a stormwater management pond retrofit to control the runoff from approximately 70 acres of developed area in the upper Good Hope watershed. This is a particularly difficult project because it involves in-stream construction, water and sewer lines, and must be shoe-horned in among existing homes on three sides. This area drains to the primary wild trout spawning and nursery area, the Good Hope tributary, which is degrading due to in-channel erosion in the main spawning and nursery area. MCDEP also has plans for two projects in the Gum Springs sub-watershed. One project involves in-stream construction to improve conditions in a number of ways, such as reducestreambank erosion and building habitat enhancements. The other MCDEP project in the Gum Springs sub-watershed involves retrofitting a badly needed stormwater pond in the lower part of the sub-watershed. This will be on parkland near the confluence of Gum Springs and the Main Stem. Construction access will be from near Fireside Drive. With all this construction going on in highly sensitive areas, we need residents to be on the lookout for problems. If you see anything that looks out of the ordinary or have questions, please use the points of contact listed on the back cover to get this information to us. Hand-remove exotic vines, shrubs, trees, and herbs. Avoid chemical herbicides due to their adverse effects on wildlife, soils, and aquatic life. Landscape with native species. Many of our worst invasives entered natural areas from suburban plantings. Replace lawns with native perennial herbs, shrubs, and trees to reduce runoff and increase infiltration of groundwater. Monitor and report violations of sediment control and runoff from existing sand and gravel mining operations. Reduce or eliminate lawn fertilizer. Meet at parking lot on right at the very end of April Lane in White Oak. Directions: From Rt. 29 in White Oak, turn onto Stewart Lane and then Left onto April Lane and follow to end. Meet at Briggs Chaney Middle School parking lot. Directions: From Rt. 198 turn onto Good Hope Rd. and go to four-way stop; turn left onto Rainbow Dr. and go to the end to school parking lot.